Yankel plays the dulcimer for his patrons, from the movie Pan Tadeusz. “Shikker iz der Goy” is one of the most popular and least charitable Jewish folk songs of all time. Its stanzas depict the respective hangouts of the Goy and the Yid, namely the tavern and the beit midrash. Its two alternating refrains, “explaining” these polar opposites by way of ethnic, even racial, determinism, reflect long-held and broadly shared biases about the sharply contrasting relationships to alcohol maintained by Gentiles and Jews. The myth of Jewish sobriety was employed by Jews to comfort, flatter, and elevate themselves above the debauched, drunken, and at times violently anti-Semitic Eastern European peasantry. But a far more sinister and predatory version of the fable of Jewish sobriety flourished for centuries among anti-Semites, particularly the temperance-preaching Catholic clergy: It was the Jews’ calculated sobriety that enabled them so effectively to operate a vast monopoly over the lucrative liquor trade by intoxicating and then exploiting innocent and inebriated Christian peasants. These contrasting stereotypes remained widespread, particularly in Poland, for centuries; they persisted through the purported demise of the Jewish liquor monopoly—inaugurated by an array of highly restrictive laws in the 1830s and 1840s aimed at shutting down the ubiquitous Jewish-run taverns. This governmental policy only intensified throughout the Russian Empire—including the so-called Congress Kingdom of Poland—in the 1860s, with the emancipation of the serfs, who, it was hoped, might seriously compete with the Jewish-run liquor business. That never happened. A mere two decades later, with the Jewish mass flight to America, these same prejudices crossed the Atlantic. The self-comforting myth of Jewish temperance was held by many Jewish immigrants to these shores—more than a few of whom went right back into the liquor businesses of their European forebears, as Marni Davis’ illuminating recent study of the disproportionate role of American Jews during prohibition, Jews and Booze, richly documents. At that time, again paradoxically enough, accusations of the calculated and manipulative sobriety of the Jews inflamed the anti-Semitic rhetoric of the American Christian temperance movement, reaching an ugly apogee during the Prohibition era, when so many Jewish owners of illegal speakeasies and unlicensed taverns, to say nothing of bootleggers, did indeed make their fortunes. Glenn Dynner’s erudite, meticulously researched, and refreshingly original new book, Yankel’s Tavern: Jews, Liquor, & Life in the Kingdom of Poland, begins by almost entirely demolishing these particular ethnic myths. He ends with a powerful polemic against the modernist biases and misconceptions held by three generations of his academic predecessors regarding 19th-century Polish-Jewish social and economic history, in which the Jewish liquor trade played such a vital role. Dynner disagrees with the many historians who have tended to accept at face value the exaggerated claims on the part of both legislators in Congress Poland and a tiny elite of Polonized Jews that they had actually succeeded in weaning Jews away from their professional and economic addiction to alcohol by encouraging them to farm, fight for their country, and study in Polish-Jewish academies. He argues that such efforts had almost no lasting impact on the vast majority of Polish Jews. Jewish farmers commonly established drinking holes on their land; Jewish soldiers, upon discharge, could not find more lucrative work than that which the tavern offered; and graduates of so-called rabbinical schools, established by radical Jewish Polonizers, were never taken seriously by either the Orthodox or the Enlightenment intellectuals and thus could find no pulpits to occupy. Yankel’s Tavern highlights the remarkable resilience of the Jewish saloons that dotted the countryside and the towns of Congress Poland, despite decades of concerted official efforts to shut them down. Indeed, at the very center of Dynner’s book lies the thesis that the Jewish liquor-vending business managed to survive—despite all the legislative and judicial attempts to crush it—thanks to a variety of ingenious ruses devised by aristocratic landowners and their Jewish arendars, or lessees, so many of whom operated lucrative taverns. Dynner begins his crisp narrative with a vivid portrait of the Jewish-operated “inns,” from late feudal times through the last two decades of the 19th century. His most important finding—supported by painstakingly extensive research in both Polish and Jewish archives—is that Jewish distillers and tavern-keepers served a critically important economic role in Poland, despite the many bans, taxes, and residential restrictions burdening them. Previous historians have shown that the Polish nobility was as addicted to the Jewish tavern as its patrons were. Dynner, for his part, has demonstrated that this state of affairs continued well into the last quarter of the 19th century. He narrates in great detail how, in the end, the Jews in tandem with the Polish nobles who had for centuries entrusted them (and no one else) with the management of their inns and saloons managed to circumvent all governmental attempts to crush this most lucrative of businesses. Dynner also devotes much attention to the role played by rabbis in issuing heterei-shutafut, legal fictions that allowed Jews to form partnerships with Gentiles so that their taverns’ activities would not be disrupted by Sabbaths and Jewish holidays. His explanation of the halakhic details of the rabbinical authorizations is, alas, too vague, and in a few instances, plainly wrong. Still, he does make the bottom-line case that scores of rabbis colluded with both the Polish nobility and their Jewish arendars in keeping the taverns open and viable. 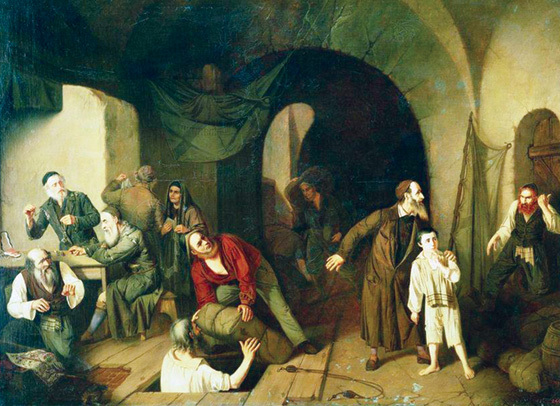 Even more originally, in two separate chapters devoted to the complex histories of the Jewish alcohol trade in their very different urban and rural settings, Dynner portrays the Jewish tavern as a unique venue for Polish-Jewish social intermingling, from religious celebrations to lively, and at times dangerously contentious, drunken debates. In doing so, he effectively overturns the commonly held notion that Jewish-tavern keepers were a major source of anti-Jewish resentment on the part of Poles. Unfortunately, in these chapters Dynner tends too often to bombard his readers with eye-glazing, detailed data and scores of statistics that would have more wisely been consigned to his footnotes. Still, his major conclusions represent an important revision not only of popular prejudices and myths regarding this topic, but also of the standard history of the Jewish tavern business in the Russian Empire. The opening words of “Shikker iz der Goy” are “Geyt der Goy in Shenkl arayn” (the Goy goes into the tavern). Of course, what it conveniently omits is that the Yid was there well before the Gentile, to open shop, ready and willing to ply Polish peasants with his home-made, kosher moonshine. Particularly surprising however is the large number of cases of Jewish alcoholism, which Dynner has gleaned from his major, private, Jewish (as opposed to official Polish) archival source, the more than five thousand petitions, or kvitlekh, presented to the non-Hasidic ba’al shem, Rabbi Elijah Guttmacher, a hitherto untapped resource that he discovered while toiling in the YIVO archives (described by Dynner in “Brief Kvetches: Notes to a 19th-Century Miracle Worker” in the Summer 2014 issue of this magazine). Aaron was afraid of Nathan because, he wrote, Nathan “always vexes me—may he not, God forbid, perform any sorcery against me.” For good measure, he slipped in a request for [Guttmacher’s] blessings over lottery ticket numbers 11,766 and 22,763. Of course, what so many Christian worshippers really sought following services was—more than rest and shelter—fun. The taverns’ Jewish proprietors were more than happy to oblige, not only serving booze, but commonly playing the fiddle to their drunken dancing—an image seared into the romantic Polish imagination by Adam Mickiewicz’s classic ballad, Pan Thaddeus, whose righteous Jewish innkeeper and decent musician, Yankel, inspired the title for Dynner’s book. Jews too, we must remember, were regular clients of taverns, especially those that served as overnight roadside resting spots—a chain of kosher, Yiddish Motel 6s—and commingled with their Catholic patrons. After a few drinks, it was far from uncommon for both good-natured joking and animated debates to dominate a late night. The book includes some fine and revealing illustrations from Polish folk art of such commingling, often featuring the Jewish proprietor fiddling while his Catholic customers dance to both Slavic and Yiddish tunes. And the mouth of our rabbi of blessed memory used to constantly utter that the bringing of the Messiah by our tzaddikim depended on this [Polish restoration]. Because first, the Polish state had to have its autonomy restored as a reward for granting permission to exiled Israel to come and settle in its land, and for receiving [Israel] with open arms . . . after its expulsion from Germany and other lands, . . . and allowing it to raise the banner of Torah and Hasidism, to the extent that all of our rabbinic authorities from the Shulhan arukh and all of our masters of Hasidism emerged from the innards of the Polish state. This is, without doubt, a powerful assertion, but not nearly as extraordinary as Dynner suggests. After all, Polish-Jewish literature and collective memory are replete with similar salutations, and even sacralizations, of Poland, going back to the 13th-century reign of Bolesław the Pious, who first issued a charter to Jews fleeing violence in the Germanic lands that offered unprecedented legal and religious protection, as well as quasi-autonomy for their kehillot and their courts. The sacralization of Polish cities, towns, and villages reached unprecedented heights with the rise of Hasidism and the intimate association of its rebbes, to this day, with those locales. And yet, despite the long history of profound Jewish gratitude to Poland, and attachment to it, as well as all the new evidence Dynner has uncovered regarding Jewish support for Polish independence, he concludes with wonderment that “it is difficult to explain Jewish motivations for supporting a Polish cause that promised them so little.” I am less surprised. In the end, Jewish tavernkeeping survived because so few of the key players in the liquor trade—nobles, Jews, and peasant customers—could fathom why the state should have been so opposed to it. And so it was, until the catastrophic events triggered by the Russian pogroms of the 1880s, when the lucrative historical Jewish economic collaboration with the Polish and Russian magnates came crashing down, less like a house of cards than a torrent of whiskey from broken barrels falling off the back of the balegoleh’s wagon. Allan Nadler is professor of comparative religion and director of the Program in Jewish Studies at Drew University. He is currently writing a history of the concept of heresy in Jewish thought. is what the sober Jew must do. to whom the answer while in Poland. How does an author, in good conscience, turn Yonasan into Jonathan ben Feiga Reizel and Schlomo into Solomon ben Reizel, call a Polish Jew "bat" anything (Liba bat Zela), and then turn around and keep the name as Eizik ben Rache (not Isaac)? And Samuel Abba? Oy! As to Poland in the Jewish mind, don't forget po-lin = here we will rest. How to render Hebrew names was, indeed, a very tough call. I opted for English equivalents whenever possible in order to ease the task of less familiar readers. Yiddish names were kept in the original Yiddish to distinguish them from Hebrew. "Bat" (daughter of) was in the original documents. A new Israeli TV show chronicles single life in Jerusalem. Avrom Sutzkever and Max Weinreich, a memoir.